It’s hard to believe I’ve been at the Hui for a month. In fact, work camp is already half over! It’s been an eye- and heart-opening experience meeting the people who return year after year, willing to pay to work eight full days on projects to improve the space just because they are so drawn to it. Some are friends who have been around longer than the Hui itself, some were family of friends who have now themselves become a foundation of support, some came for a workshop and fell madly in love with this place. Listening to stories of the transformation of the space into what it is now, and the ways that it has transformed individual lives makes me feel very privileged to have been chosen to come here. It’s sure a sight to see beaming, dust-covered folks in painting clothes–who are secretly doctors, university professors, and Superior Court judges back home–getting so much enjoyment out of painting buildings, cleaning windows, pouring concrete slabs, or replanting a hillside with thousands of native plants in the grueling sun. It’s kind of like summer camp for grown up kids. Before returning to work after lunch, we suntan while bare-bottomed swimmers splash around in the pool. 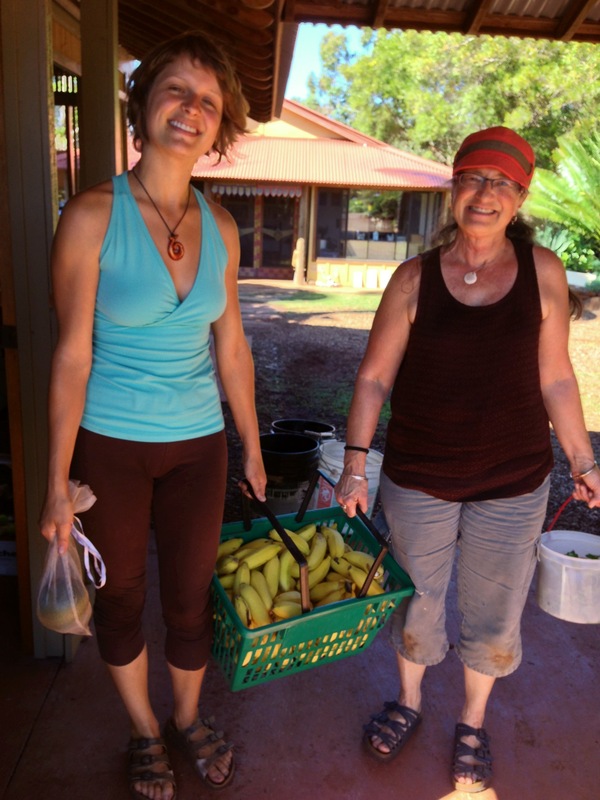 At three thirty every day, the Zen Team rolls in with Sweetie Cart, loaded with chips, cookies, fresh Hui bananas, and Mocha Mamas. Mocha Mamas are an institution here, the iced mocha coffees are sold a mile down the road at the Coffees of Hawai’i plantation. And oh my, are they delicious! At five fifteen, popcorn is served on the front deck and it’s a BYOB mojito happy hour. On Sunday, most people took the afternoon off to watch the Superbowl on the giant screen. So of course, it was chili and cornbread for dinner, shared with a bunch of real live Texans. Talk about a cultural experience! Yet these folks are very conscious types. In fact, we’ve been just as likely to curl up together and watch artsy independent movies and historical dramas or to have spontaneous hugging lines as we watch the sun go down. Last night, a funk jam erupted out of nowhere in the living room just as the Thai curry dinner was being served. It was a good thing we happened to be eating something that fit into an easy-to-carry bowl. Otherwise, I might have been too busy getting down to “Play that Funky Music White Boy” with silver-haired punks in sideways hats and sunglasses to have a chance to eat. It’s true, they sure know how to keep the community vibe strong. Every morning, we all circle up together and hold hands while someone offers a prayer, intention, poem, or other expression to set the tone for the day. On the first day, a new friend shared a hilarious and touching piece of writing he’d written about how friends are like gardens. You’ve got your veggies, your shrubs, your trees, your flowers.. and your weeds. And they all play a part in life. After a deep conversation last night with one of the women, in which I described the gratitude circle I learned at O.U.R. Ecovillage that’s becoming a trend among our friends back home, she shared the gratitude circle this morning. Each person took a turn saying something they are grateful for. Among so many things, I was grateful that this simple practice had found its way into yet another group of grateful folks. One of the most enriching parts for me, though, is realizing how far I’ve come as a gardener since I arrived a month ago. 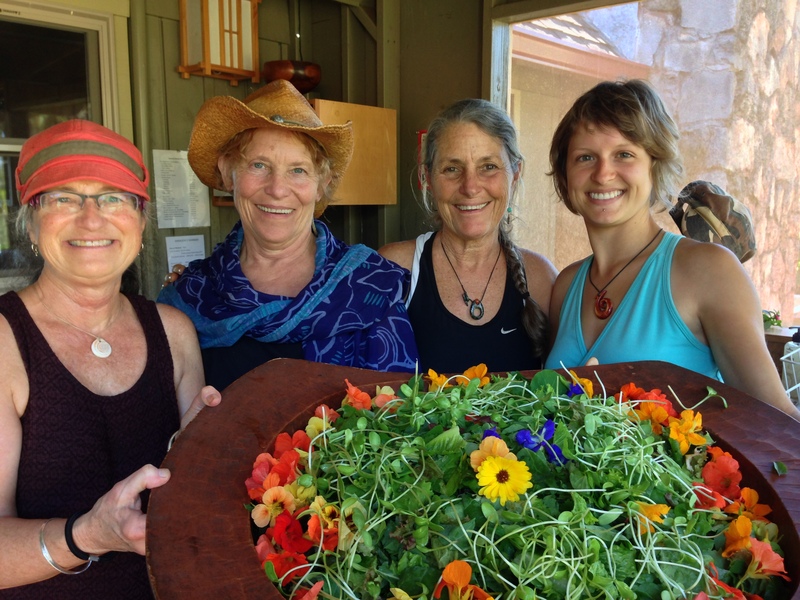 Leading the garden team and organizing the projects, I’m with a small group of women who have themselves been gardening for years, including a few that started the original Hui garden back in the day. While I’m looking to them for long-learned wisdom, they’re excited to learn a lot of the techniques I now know thanks to my internship. I’ve been showing them how to prune and train vine tomatoes, harvest fruit in the orchard, build a good hot compost, transplant young plants, and produce a highly diverse, nutritious, and beautiful salad for thirty-five ravenous leafy green eaters (trust me, it’s a significant daily undertaking). Connie would be so proud! 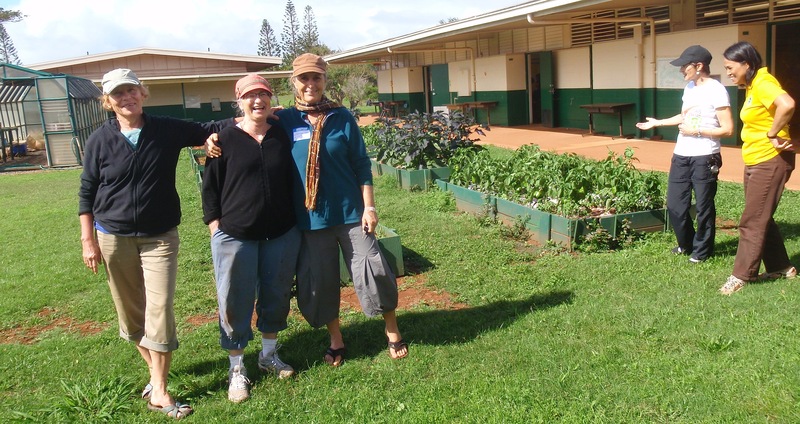 The last of so many memorable moments I will mention today is the heartwarming field trip our garden team took to the Kualapu’u School garden. As I’ve mentioned before, this school down the road from us is the only public Hawaiian immersion school. Eighty percent of the kids live on the homestead lands–lands that were returned to the native Hawaiians so they could farm it and become more self-sufficient. Unfortunately, farming has historically been very difficult on Molokai for a number of reasons (big winds, expensive transportation, historical/social factors) and a high number of families are third-generation welfare recipients, with very few people growing food and hardly any making a business out of it. 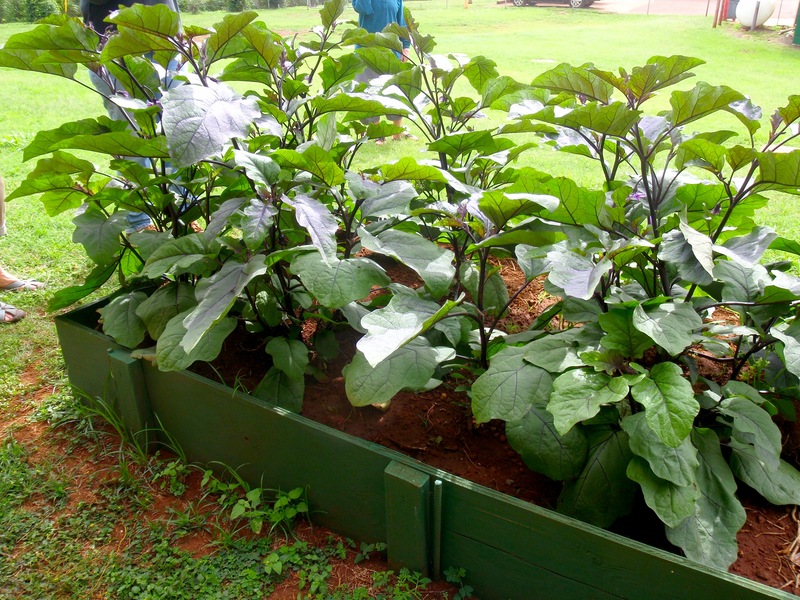 But as the Kualapu’u School principal pointed out, the Molokai high school team is called the Farmers, and the elementary school kids should at least be exposed to food growing and have places to interact with gardens. 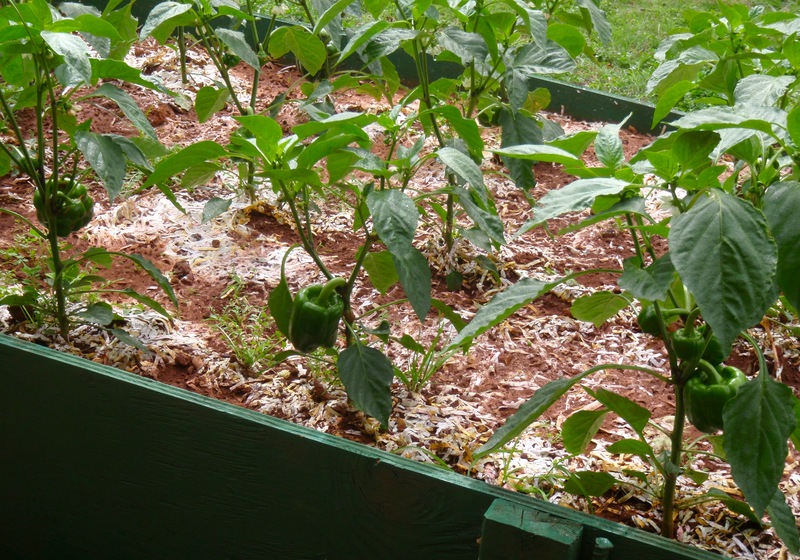 So about seven years ago, they launched a veggie garden as their after-school program. The principal toured us around the many raised beds filled with stunningly beautiful veggie plants. Bell peppers and eggplant, two crops we’ve had trouble with at the Hui, were standing tall, strong, and healthy. Kalani, the big gardener guy, just happened to be around to answer the excited chatter of questions from my garden team. 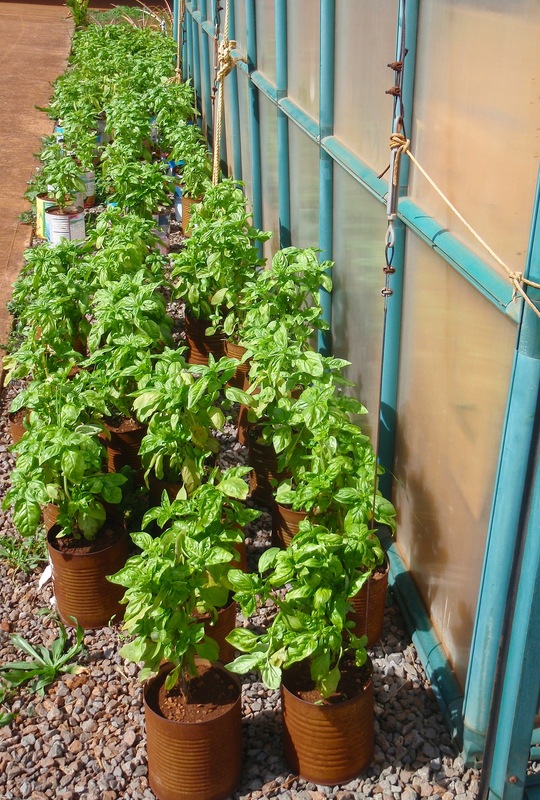 We wanted to know how they got such a forward-thinking program in place and, of course, how their plants look so good! Rich runoff soil was one factor, he said. But in his thick Hawaiian Pidgin, Kalani tipped us off to what he believed to be the real reason for the happy plants: the energy of so many happy children buzzing around them. Now there’s a wise gardener to learn from! The official 2013 Hui Garden Team with our delectable size-XL salad! Me and QuinSerra bringing home the goods – avocados and bananas! The school greenhouse! what a setup!